BELMAR, N.J. (CNS) — Catholics from around the greater Belmar area and way beyond braved highways barren of traffic lights and a landscape badly mangled by Hurricane Sandy to attend Mass Nov. 4 at St. Rose Church with Bishop David M. O’Connell of Trenton. They came, despite gas rationing and hard-to-navigate roadways realigned by the storm, to thank God for surviving what is said to be the worst hurricane to hit New Jersey in modern history. They were looking for hope, as Msgr. Edward J. Arnister, pastor, put it while standing in the sanctuary of the semi-dark and very cold church just before the 10 a.m. Mass began. Before the line subsided, he estimated that 800 people, many carrying small children or escorting elderly relatives, overflowed all the aisles and spilled over into the vestibule. “They are looking for a spark of fire in an all too dark world,” Msgr. Arnister said as he watched a seemingly endless line of people of all ages from St. Rose and other parishes fill the 500-seat, Victorian Gothic structure to overflowing. Before they returned to their dark and, for many, damaged homes, that spark would indeed be lit. From the conversations overheard just before Mass began, it was clear that many in attendance had survived generations of New Jersey hurricanes, including last summer’s dangerous Irene; but never one as fierce as Sandy, something Bishop O’Connell acknowledged as he began his homily. In the four counties of the Trenton Diocese, many parishes, especially those along the shoreline of Monmouth and Ocean counties and the bay and back waters of Mercer and Burlington, were hit by Sandy. In a number of coastal parishes, including St. Rose, the damage was severe. All of the buildings on the campus in downtown Belmar suffered flooding that ranging from 2 to 9 feet high. The schools were impacted the most, with St. Rose Elementary School losing its roof and St. Rose High School suffering a level of damage still to be determined. 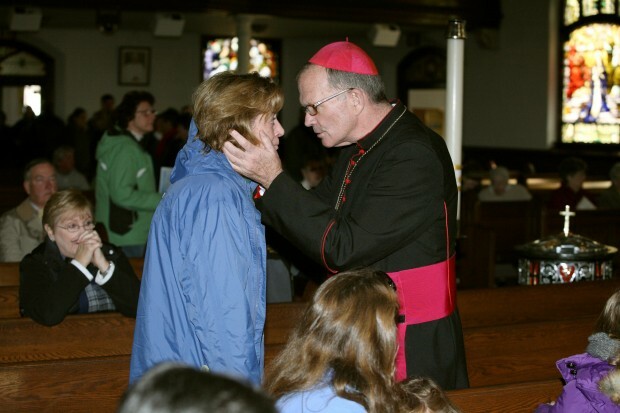 Bishop O’Connell visited Belmar shortly after the storm, one many stops he made shortly after Sandy struck. “I spent the past few days visiting parishes, including here,” he told the assembly. The bishop said he was stunned by the amount of destruction and the way Sandy “affected in every way possible,” the people of the area. He spoke briefly of the overwhelming interest in the storm from media around the world including the BBC, which reached him during a visit to St. Benedict Parish in Holmdel Nov. 3, as the first of many diocesan distribution centers opened. He encouraged everyone to “continue to call God our father” and to think of church as family. In these days of suffering, he said, “the best we can do” is unite our suffering with the suffering of the Lord. “Luckily for us,” he said, surveying the crowd where many strove unsuccessfully to keep the tears from flowing unabated down their cheeks, “there is more joy, more happiness than (evil)…” and exhorted them to focus on that as they go about the task of rebuilding their community. After Mass concluded, the church rocked with applause as the bishop presented Msgr. Arnister with an advance of $100,000 from the diocese so that the work of addressing the storm damage could begin at once rather than waiting for insurance payments. Waiting for the crowd to surge down the steps were members of the parish’s Society of St. Vincent de Paul conference who manned a well-organized table where those affected by Hurricane Sandy could fill out cards detailing their immediate needs. Like many at the Mass, DeBartolo and Eileen Ziesmer, also a Vincentian, said their properties had been spared the full ravages of the storm. There’s a new saying in Belmar, according to the women. “Everyone’s safe. Just no power,” DeBartolo said. “No damage, no power. We’re lucky,” Ziesmer added. Rogers is features editor at The Monitor, newspaper of the Trenton Diocese.